Patricia Loofbourrow MD was born in southern California in 1962, and currently lives in Oklahoma. Learning to read at the age of three, she grew up on Heinlein, Bradbury, and Asimov, and found at an early age that she loved science. Earning a Bachelor’s degree in Microbiology with a minor in Chemistry from Cal Poly Pomona then an MD from Rush University, Dr. Loofbourrow practiced family medicine for ten years before becoming a stay at home mom in 2000. After leaving medicine, Patricia Loofbourrow ran one of the first “ask a doctor” patient education websites from 2000-2004. Patty wrote her first novel during the 2005 National Novel Writing Month, going on to write ten novels, five novellas, and well over 100 short stories, mostly speculative fiction. 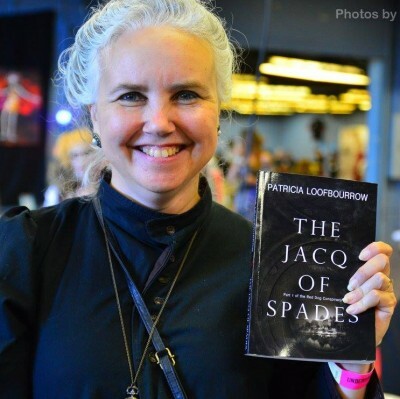 Her debut novel, The Jacq of Spades: Part 1 of the Red Dog Conspiracy, was self-published in 2015 and was part of the NYT and USAT best-selling science fiction and fantasy box set, Dark Humanity. She has been a long-time member of the Forward Motion Forums, and was the founder of Fifty Word Fiction on DeviantArt. She has worked as a freelance non-fiction writer and editor since 2000, and currently runs an informational website on edible landscaping.